Der Spiegel magazine has aggravated tensions between Germany and Italy with a contemptuous article accusing the Italians of being ungrateful “moochers” who are pulling Europe into a crisis reminiscent of Greece’s. Germany’s real problem with Italy, of course, is its newly formed populist government, following national elections that heavily favored anti-establishment, Eurosceptic parties on a collision course with the Germano-centric European Union (EU). Last week’s issue of Der Spiegel heaped praise on Italian president Sergio Mattarella, calling him “a silent, coherent man who does not bend,” after he threw out a proposed cabinet including the Eurosceptic Paolo Savona as finance minister. 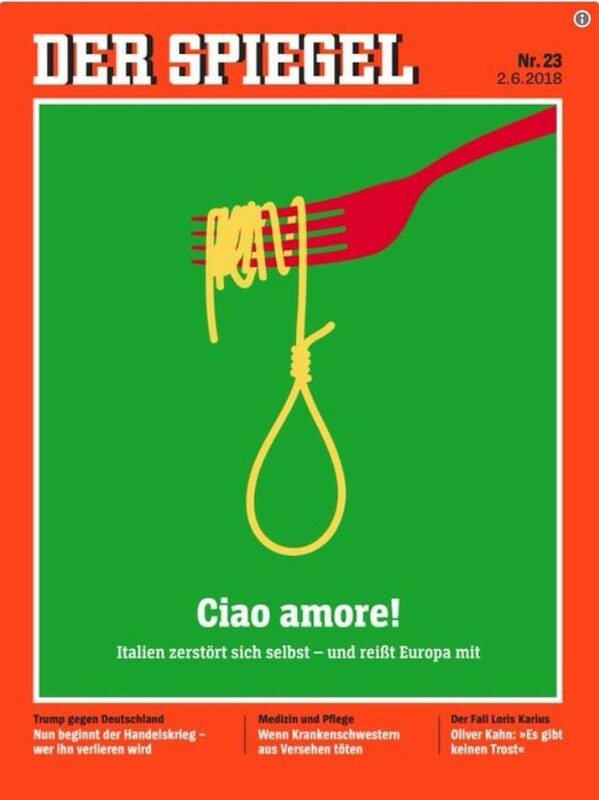 This is not the first time that the German press has taken issue with Italy in the wake of the March elections. Just weeks ago, the Frankfurter Allgemeine labeled Italy as “Europe’s chief source of concern” along with a vignette depicting a van falling off a cliff. 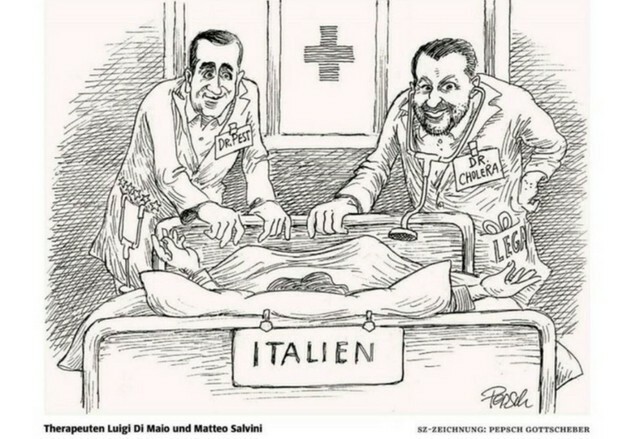 For its part, the Suddeutsche Zeitung depicted Italy as an agonizing patient in the hands of Drs. Cholera (Salvini) and Plague (Di Maio). 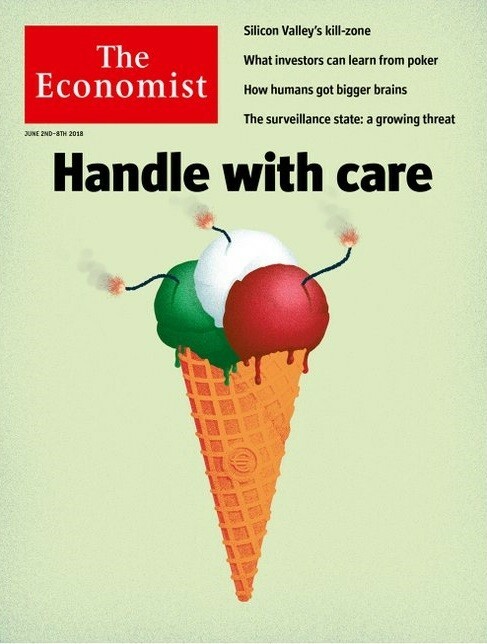 In its accompanying article, the Economist was typically dismissive of Italy’s new political leaders, asserting that “the populists have little idea how to deal with the myriad causes of Italy’s stagnant productivity” and other deep-set problems, suggesting that recently ousted establishment parties would have done a better job of getting the country back in shape. In article after article, mainstream media representing the interests of capital markets and the European Union have covered Italy’s populists—and by extension the majority of Italian voters—with opprobrium, just as mainstream media did in the United States after the Trump election. By doing so, they simply confirm what populists seem to have grasped long ago: that people are fed up with being lectured by schoolmarmish establishment elites and have decided to govern themselves for a while.